When it comes to sleep time, the darker the better, but what about the other hours spent in your bedroom? Readying for bed, dressing in the morning, reading, relaxing, romance… a bedroom is a busy place even during waking hours. Those activities take a well-lit bedroom – one with several light sources layered from ceiling to bedside. Probably the most common source of overhead bedroom light, flush-mount fixtures sit directly against the ceiling and are typically a light bulb covered with a decorative glass or plastic bowl-shaped cover. In a small-to-medium size bedroom, this may well be all the overhead lighting you need. Look for fixtures that complement your bedroom’s decorating style. Many flush-mount fixtures are very simple, but there are choices with a bit more flair. Metal or painted trim, molded glass, and unusual shapes are all options. This is the best choice for low ceilings of 9 feet or less. To prevent unpleasant glare while lying in bed, choose a fixture that has a covered bottom. Otherwise, you’ll be looking up at a bright bulb. Frosted or marbled fixtures are best for the bedroom, as clear fixtures are a bit too bright for the space. A remote control means you don’t have to get out of bed to turn off the light. Another very popular bedroom lighting choice, the semi-flush-mount fixture is similar to the flush-mount but drops down a few inches on a short rod. Often, there is a decorative medallion around the fixture’s base on the ceiling. You’ll probably find the widest range of styles and designs in this lighting category, but many are more suited to other rooms of the home. Although clear glass, open-bottomed and highly shiny fixtures are lovely choices for the foyer or living room, they are too bright for the bedroom. This is a great choice if your bedroom’s ceiling is 10 feet or more. Keep the size of your light fixture in scale to your bedroom’s size. In a large room, choose a large fixture. If your bedroom is small, look for an equally small, simple fixture. Pendant lights hang down from the ceiling on a chain or on a long rod. This very trendy and versatile type of light fixture makes a big splash in your bedroom’s décor and is especially popular in contemporary bedrooms. Pendant lighting is best with high bedroom ceilings – 10 feet or more. You can use pendant lights as bedside lighting by dropping them down over the nightstands. Just make sure to leave enough space between the nightstand and the bottom of the pendant: at least 12 inches and up to 22 inches. If you are hanging pendants for general room lighting, position them near the bottom of your bed, towards the center of the room. In the bedroom, pendants look best over the bed or other furniture, rather than hanging over walkways. You need high ceilings for a chandelier. Hanging a chandelier in the bedroom is a balancing act. While you don’t want an excessively large chandelier in the bedroom, generally, the lower you hang the fixture, the larger it should be. Still, for a small bedroom, keep the chandelier to no more than 20 inches in diameter. In a larger bedroom, limit the chandelier to no more than 30 inches across. Chandeliers vary widely in the intensity and amount of light they provide. In the bedroom, you’ll want one that casts diffuse, moderate light. Don’t hang a chandelier directly over the head of your bed – keep it towards the center of the room and the lower third of your bed. Ceiling fans can be flush-mount, semi-flush-mount or dropped a foot or more, but they aren’t a choice for bedrooms with very low ceilings. Frosted or white opaque glass is the best choice for the bedroom. While ceiling fans are often casual or country style, you’ll find plenty of sleek, modern designs well suited for contemporary décor. A remote control is a must for a bedroom ceiling fan. You might think recessed lights – also called can lights, downlights, or pot lights – are only for the living room, but they actually are a very contemporary choice for the bedroom. In an especially large room, recessed lights work well in combination with other types of ceiling fixtures. Recessed lights are good with any height ceiling, and give the illusion that a low ceiling is higher than it really is. Generally, you’ll want your lights spaced 3 feet to 5 feet apart in an average-sized bedroom. Four to eight lights are usually enough for bedroom use. Lights should be positioned around the perimeter of the room. In a very large room, you’ll probably need an additional row. A dimmer is a must for recessed lighting in the bedroom. Use recessed lights to define a separate reading or sitting area. Recessed lights are the best choice for a walk-in or large closet. Track lights are positional spotlights affixed to a metal track on the ceiling or wall, and usually used to spotlight artwork or accents in a room, not for general lighting. It’s not used in the bedroom as often as the other varieties of ceiling light fixtures but can work well to highlight a special feature in a large bedroom or brighten the dressing or vanity area. Track lighting works best in a contemporary or minimalist bedroom with high ceilings. There are many styles of track heads, including pendant styles, cans, and traditional spotlights. Track lighting is a good choice for large walk-in closets. From sleek contemporary to rustic country, there is a style of wall sconce for every decorating theme. Sconces are an excellent choice for the bedroom and are typically installed on each side of the bed. Use wall sconces in place of a bedside lamp to save room on a small nightstand, or keep the room looking uncluttered. Sconces with adjustable swing arms make it a breeze to position the light right where you need it for reading in bed. Install your sconces near enough to reach easily from the bed. This generally means they should be four to six inches out to the side of the headboard and approximately two feet above the mattress, but the exact position depends on the style of sconce and your personal preference. 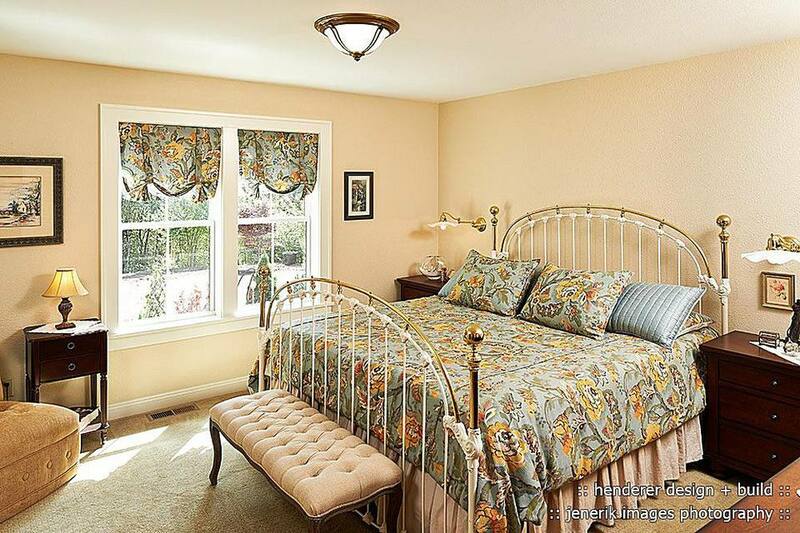 Sconces with small shades or covers protect your eyes from glare and are best when used next to the bed. If the bed is not shared, save on space by using a floor lamp in place of the extra nightstand. Use a floor lamp to illuminate your reading nook or bedroom seating area. Floor lamps with adjustable heads make it easy to direct light where you want it. Every bedroom needs a bedside light of some kind. Most often, that light is a table lamp, although floor lamps, wall sconces, and pendant lights are other options. Your bedside lamp needs to be practical, but that doesn’t mean it can’t add a powerful punch of décor to your bedroom. With so many choices available, there’s no reason to have an ugly or boring bedside lamp or make do with a dull lampshade. Jazz it up with a colorful or patterned lampshade and a lamp that makes a bit of a statement. For the most comfortable bedtime reading, pick a lamp that is a couple of inches taller than your nightstand. This will keep the light out of your eyes, but close enough for comfortable reading. You should be able to reach the lamp’s switch without an uncomfortable – or unsafe – stretch. For the best appearance, pick a lamp that is properly scaled to your nightstand’s size. Three-way bulbs make it easy to brighten up your bedside lamp for reading or tone it down when it’s time for romance.